Teck Resources, The Chemours Company, United States Steel, Helca Mining, and Titan International have all posted better than triple digit gains in 2016, and each pays a dividend. I think it's pretty safe to assume that anyone would be happy with a stock that gains more than 200% in a year. So far in 2016, there have only been handful of companies that have accomplished this feat. What is even more surprising is that some of them pay dividends. As of November, there have been five dividend paying stocks that have gained more than 200% on a total return basis so far this year. Let's take a look at this select bunch of dividend paying stocks and determine whether any of them have more room to run in 2017 and if investors should be looking to add them to their portfolio's. Which companies are up big, and why? There are two common themes with most of these companies. First, with the exception of Chemours, these companies have significant exposure to commodity markets. Hecla Mining -- silver and gold -- and Teck Resources -- mostly copper, metallurgical coal, zinc, and Canadian oil sands -- have direct exposure to commodity prices, while United States Steel's business is caught between the commodity markets of consuming iron ore and metallurgical coal to make steel. Titan International, a tire manufacturer, isn't directly involved in the commodity markets, but the bulk of its business is in selling tires to large equipment companies involved in agriculture, construction, and mining. Companies in those respective industries have scaled back capital spending to conserve what little cash is coming in the door. As a result, sales of tires to those businesses have suffered mightily. The once exception to this theme is The Chemours Company, which is a chemical manufacturer that specializes in titanium oxide, fluoroproducts, and some other specialty chemicals. Chemours was spun off from DuPont (NYSE:DD) in July 2015, and in some ways left for dead because the chemicals it produces are considered more commodity type chemicals with little pricing power. However, some operational cost cutting has helped the company turn its results around in recent months. The second thing is that most are recovering from long, steep price declines. Compared to its IPO price last year, shares of Chemours are only up 13%. As for the rest of the bunch that have been around for a while, any stock chart that looks back 5 to 10 years shows a much grimmer picture than 2016's results. For the companies in the chart, January 2016 was the worst of times, with stock prices hitting lows that were as bad, if not worse, than the depths of the financial crash in 2008. When all of these companies are working off such a low base, it's much easier to generate such huge gains. The strong share price gains from all of these companies might suggest that the markets in which they operate are starting to show signs of improvement, and that perhaps there is still lots of room for these companies to run. After all, as those long-term price charts indicate, we are still a ways away from a full recovery. United States Steel relies heavily on older, costlier technology for its steel production rather than modern tech that is more cost effective and more responsive to the ups and downs of the market. It also doesn't help that U.S. Steel has a crippling debt load that prevents the company from making the capital investments necessary to convert over to this new technology. Titan International also has an incredibly high debt load. Annual interest payments on its debt are greater than total EBITDA the company brought in over the past 12 quarters. 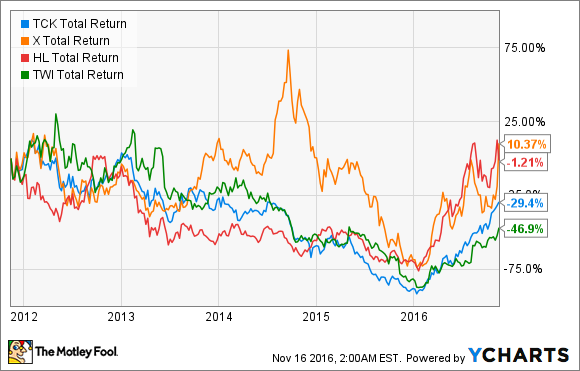 While not nearly as bad, Hecla Mining is also highly leveraged for a smaller precious metals company. The company has significantly lowered its debt levels in recent quarters, but it still has work to do. Teck's large exposure to metallurgical coal could become a headache as more and more steel production capacity transitions toward newer technology that uses natural gas instead of metallurgical coal. Thousands of legal cases have been brought against DuPont and 3M over links to perfluorooctanoic acid (PFOAs) -- a compound found in several of their products -- and its link to various cancers. When Dupont spun off Chemours, though, Chemours agreed to indemnify DuPont for "uncapped amounts" in all PFOA-related matters. One recent case rewarded a client $5.6 million for PFOA links to his diagnosis of testicular cancer. If this becomes a bigger issue, it could cost Chemours hundreds of millions. To anyone that bought these stocks at the beginning of the year and have held onto them, then a golf clap for you as these stocks have likely done very good things for your portfolio. While the boarder market suggests that there is a lot more room to run for all companies in these respective industries, all five of these companies have some major flaws that could come back and nip them in the bud over the long term. If these issues are addressed and the fundamentals for their respective industries improve, then maybe these companies will continue to do well for investors.